It’s that time again where the kids are heading back to school, leaving the house empty all day. But that’s not completely true if you have a furry little friend at home who is going to be waiting for someone to return. 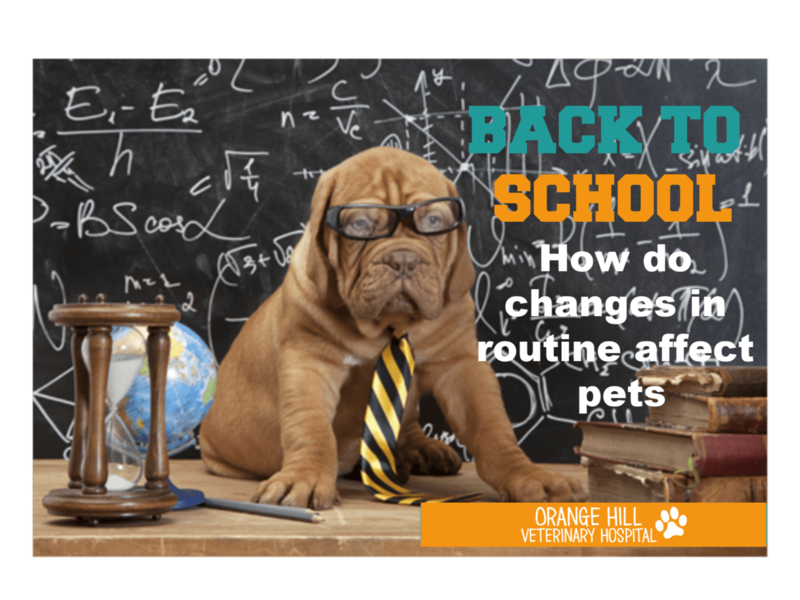 When the back to school seasons comes around, you need to be thinking about how this change in routine is going to affect your pets. The first thing that you should do if you notice any of these signs is to take your pet to come see us at Orange Hill Veterinary Hospital so that they can receive a check-up and the best possible veterinary care. This is so you can rule out any physical medical conditions, such as a urine infection, and make sure that your dog is healthy. If our veterinarian does not find any physical problem with your dog you should then make sure that it is not the result of boredom in the dog, scent marking or just general destructive chewing.